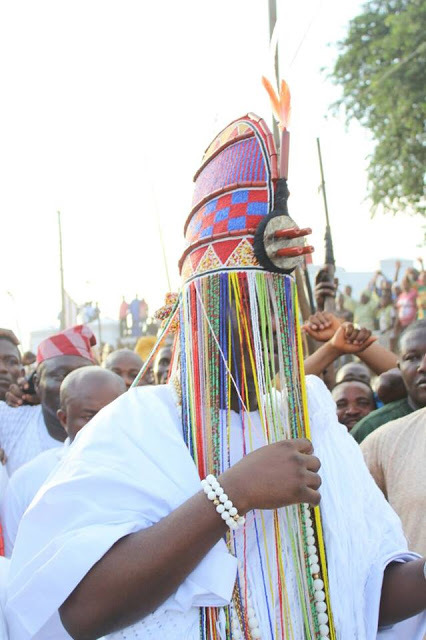 The crown, which spiritually weighs over 70kg, is always worn once in a year by the Ooni during which major gods in the city are appeased. 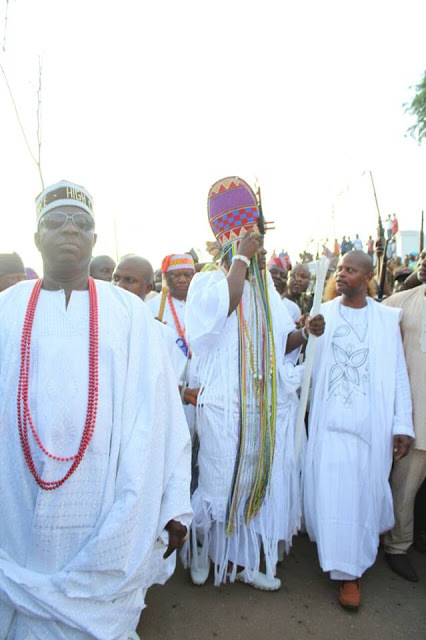 The Aare is a special crown made of 151 items, part of which is cutlass and hoe.‎ The crown is expected to be worn during the annual Olojo festival in the ancient city. 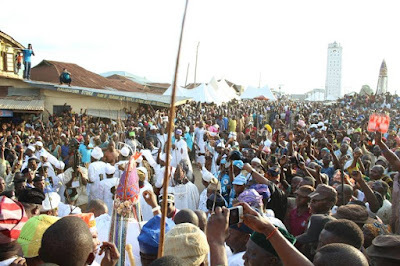 As the Ooni walked out with the Aare crown, thousands of viewers, whom are indigenes and non-indigenes of Ile-Ife were praying and hailing the king. 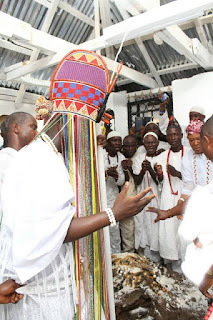 Dressed in all white apparel, Oba Ogunwusi, who had been in seclusion for seven days, left his residence for Oke Emese(Emese court) within the palace premises, around 4: 00 pm to perform final rites before he wore the mystic Aare crown. 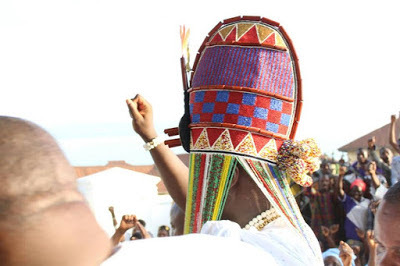 At exactly 5pm, Oba Ogunwusi came out with Are crown on his head and a white dove, praying for the peace and progress of the ancient city and the black race. 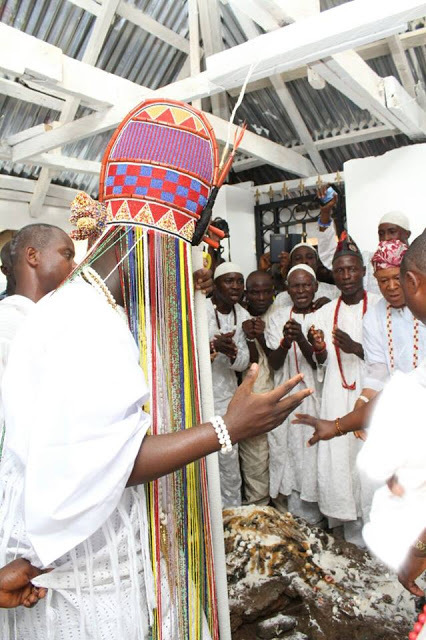 He subsequently proceeded amidst prayers and several gunshots to Oke Mogun(Ogun shrine) and Idi Aje two major ports of call during Olojo Festival where rituals and prayers were said for the peace of Nigeria and Yoruba race. On the procession of Ooni to Oke Mogun were former Governor of South West and Are Tobalase of Ife Admiral Akin Aduwo, Cuban Ambassador to Nigeria, Mr Carlos Tredjo Sosa, former President Nigeria Guilds of Editor, Mr Gbenga Adefaye, a Special Adviser to Lagos state governor, Mr Kehinde Bamigbetan, Senator Babajide Omoworare, Hon. Rotimi Makinde, Professor Adeyemi Aderibigbe, Leader of OPC, Dr. Frederick Fasheun, Minority Leader of Osun state House of Assembly, Hon. 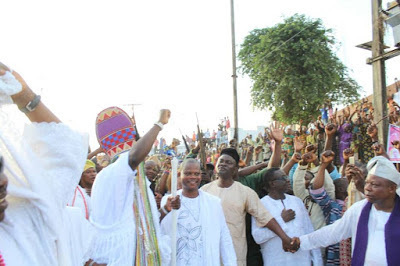 Safiriyu Akinwole, some royal fathers led by Ajero of Ijero kingdom, Oba Adewole Joseph, Ife chiefs, priests and members of Oodua Peoples Congress, OPC, as well as indigenes and tourists from different parts of world. Before Ooni commenced the trip, his traditional emissaries known as Emese, who wore only shorts, wielding coated canes performed the symbolic sprint to Oke Mogun shrine three times to clear the route the monarch would take.